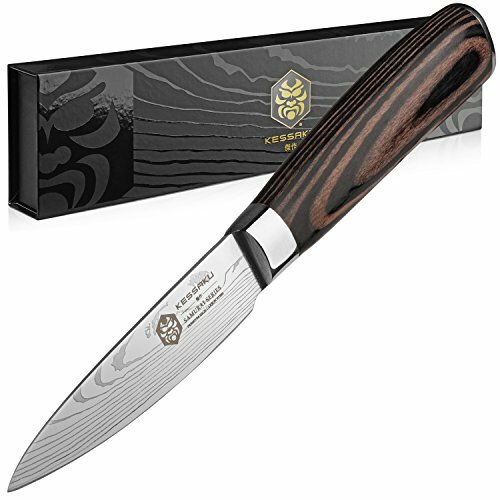 Kessaku's Samurai series 3.5" professional Paring knife will be a staple in your kitchen and will become your go to knife. The knife is constructed by hand of a high carbon 7CR17MOV Stainless Steel, has a 58+ Rockwell Hardness and is very resistant to corrosion and rust. The mirror polished, smooth pakka wood handle offers superior strength, while its sanitary build ensures no dirt or debris collects. The handle is heat, cold and moisture resistant and is constructed utilizing a full tang. The blade is hand sharpened by a 16 degree angle per side. The knife is well balanced so you won't feel dragged down and it's ergonomics reduce aches and fatigue. Please hand wash then wipe and dry clean. PARING KNIFE: A paring knife is a straight edge all purpose small knife with a lot of uses and is ideal for peeling, de-veining a shrimp, removing the seeds from a jalapeño, skinning or cutting small garnishes. Used more often than bread knives, filleting and butchering knives, utility knives, slicers, and cleavers a paring knife picks up where a chef's knife leaves off. It's best for slicing and mincing items that are too small for an 8- to 10-inch blade, such as garlic, shallots, or strawberries. Because of its size a paring knife is a great tool for any foods that require an attention to detail. ✅ 100% LIFETIME WARRANTY. TRY IT TODAY - We offer our true LifeTime warranty against manufacturing defects. We take all the necessary and proper precautions to ensure you're delivered a true quality masterpiece. We want to ensure you are happy so contact us with any issue or concern and we will do our best to make it right. Cuchillo de cocina para la preparación de comidas cortar dados picado picada profesional Japoneses.